She’s here! Dd arrived with a lot more speed than any of us were expecting, just after 1pm on Wednesday 27th February, at home. She is 11lb 15oz (! I know. In fact out of the three births her’s was the fastest and most straight forward.) We are both doing well and the five of us are just slowly finding our way towards a new normal. Her big brother and sister are smitten and everyday feels a bit like Christmas in the best and most overwhelming sense of the word. 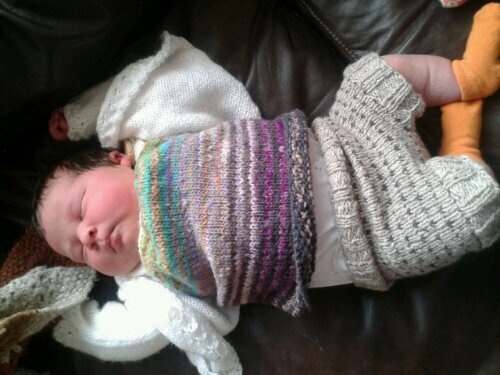 I’ll hopefully be back soon with more of her knitwear and her blanket, and maybe even a birth story for those who like such things. Congratulations! Wow! What a beautiful girl, and such a good, healthy weight. Yahoo! Huge congratulations – I was hoping the blog silence was a sign of a recent arrival, and had been checking to see if there was any news…. Well done all round – glad to hear it was straightforward (if speedy), at 11lb 15oz that's some achievement 🙂 [makes my 7lb and 8lb babies seem small!]. Enjoy that babymoon – she looks fab (love all the hair and the round cheeks) – and I hope you are feeling fab too.